Hey, you know the Chevrolet Malibu? No? Can't picture it off the top of your head? That's okay, we can't blame you. It hasn't been particularly inspiring. But we hear that GM is aiming to fix that. Rumor has it that the Malibu, a car launched just last year as a 2013 model, is getting one of those Honda Civic-style emergency refreshes. Apparently, the new 'Bu will look a lot less forgettable than the current model, which wasn't terribly impressive to drive, either. 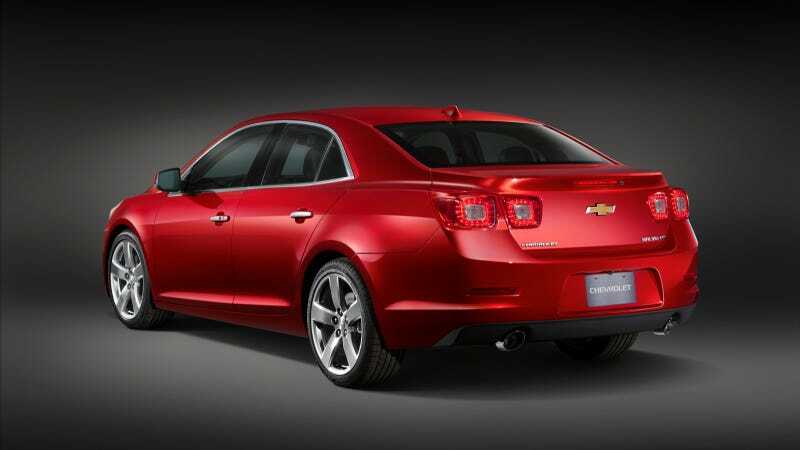 We've known for some time that Chevy was working on a refresh of the Malibu — Car and Driver has some spy shots of it. As they noted, the current car's interior is kind of lackluster, as is its hybrid version. But it's the kind of car that Chevrolet needs to be a hit. This rumored Malibu refresh may or may not show up at the New York Auto Show this week, so stay tuned. In the meantime, can anyone out there confirm this? Will the updated Malibu look insane enough for people to actually remember it?